Last night around 2 am I woke up by myself on the bottom bunk of my kids bunk bed. The storm outside had settled, the wind a silent whisper and the rain a gentle drumming. I faintly remembered stumbling out of bed and tripping over toys to get to my kids who were wailing in fright at the thunderous sounds of the storm. And now here I lay, by myself. The nightlight blinding me as I look around for my little ones. I head first to my room and poke my head inside where I found 2 sleeping cherubs gently snoring. One was my 3 year old daughter, they other my 29 year old husband. And so the search continued. I peeked inside my littlest guy’s room and withdrew as soon as I heard his deep steady breaths from the crib! Oh such a sweet sound. 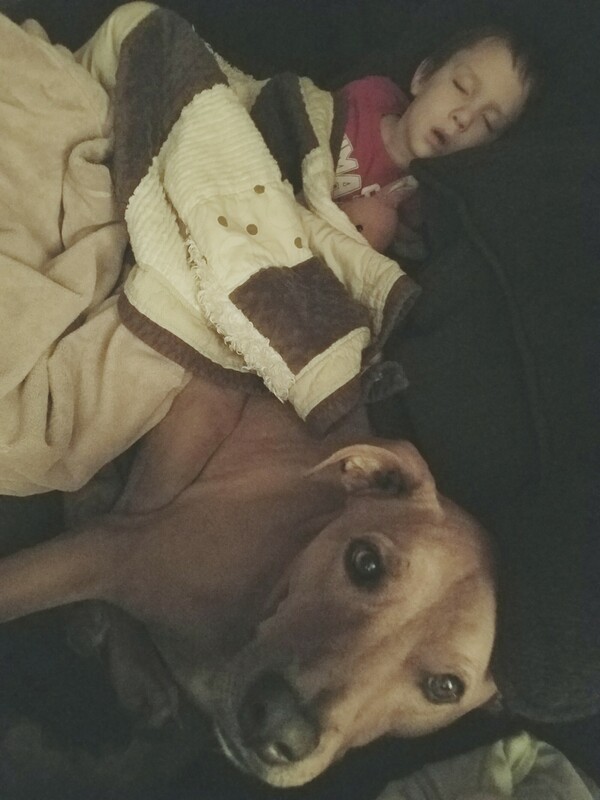 My oldest couldn’t be far… down the hall I roamed and as I turned the corner into our living room, my oldest was there sleeping like a baby with his fur baby! My heart pitter pattered and my swollen sleepy eyes smiled. Oh a boy and his dog… who can separate!?! ?